The over 800 kilometers long Rhône is one of the most important wine rivers in the world. Like everyone waters Does it have a positive effect on viticulture or creates the conditions for this by forming sometimes very steep valley slopes. The river rises on the Furka Pass as a glacier stream in the Swiss Uri Alps, flows through the canton under the name Rotten Wallis and Lake Geneva, crosses the French border, turns south from Lyon and flows south of Arles-sur-Rhône into the Mediterranean Sea. The Greeks founded in the 6th century BC. The city of Marseille (Massilia), located at the mouth of the Rhône, brought the grapevine in the valley. Also the Celts (Gauls) already operated viticulture in today's two appellations Côte Rôtie and Hermitage (Crozes-Hermitage). Allegedly, they taught the Romans the art of finishing of the vines. The Roman scholar Pliny the Elder (23-79) reports of a grape variety Allobrogica, which was supposedly cultivated here by the Celtic tribe of Allobroger. At the beginning of the second century, the area became part of the Roman province of Gallia Narbonensis. Roman viticulture testify to many finds of amphorae, Statues of the wine god Bacchus and mosaics with wine motifs. Many exhibits are exhibited in the "Musée de la Civilization Gallo-Romaine" in Lyon. At the beginning of the 14th century, the Papsthof was moved to Avignon, and from 1309 to 1377 seven recognized popes ruled here. This gave a strong impetus to viticulture, since most of the wine on the papal table came from the Rhône Valley. The name Châteauneuf-du-Pape derived from the castle Pope John XXII. (1245-1334), which he had built as a summer residence north of Avignon. The Rhône wine-growing region or "La Vallée du Rhône" is understood to mean the approximately 200-kilometer route from Lyon to the south to Avignon in south-eastern France. On both sides of the Rhône and its tributaries are about 80,000 hectares of vineyards, over the six départements Ardèche. Drôme. Gard, Loire, Rhône and Vaucluse are distributed. 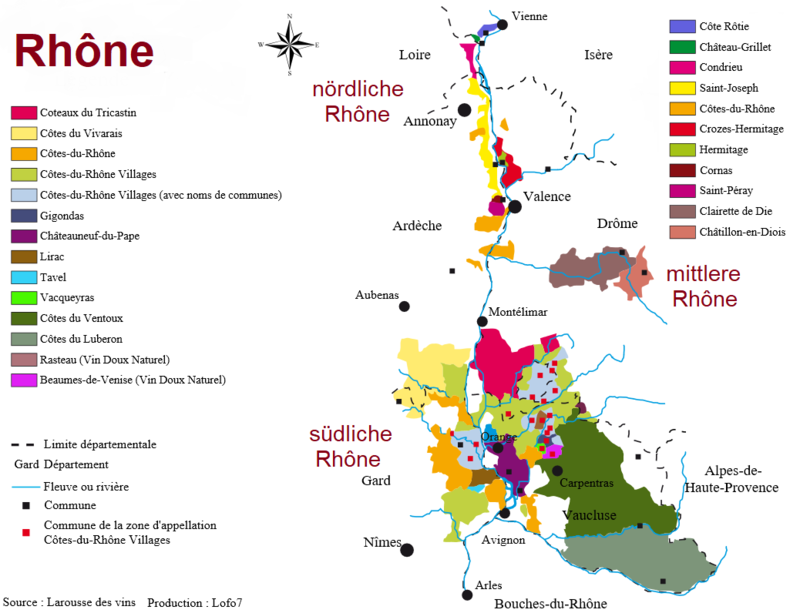 But only a small area in the north is in the Rhône department and, surprisingly, it accounts for 70% of the northern neighbor's production Burgundy, Over 150 kilometers, the Rhone runs parallel with the Loire which gave the eastern region its name. The two rivers are only about 50 kilometers apart on this route, but flow in opposite directions. The elongated wine-growing region is divided into "Rhône Septentrional" (septentrional = north) and "Rhône Méridional" (méridional = south). The two sections are very different in terms of climate, soil and grape varieties. Common to both, however, is the Mistral, a cold and dry north wind, defended by many vineyards with cypresses and poplars. The wines from the left (eastern) shore are generally considered heavier and more alcoholic. In total, more than 90% red wines from almost 6,000 farms are produced in the region, with the remainder being rosé and only a negligible amount of white wines. The northern section begins at the town of Vienne, near the three appellations Château-Grillet. Condrieu and Côte Rôtie lie. It extends straight south to the town of Valence with its appellations Cornas and Saint-Péray, The climate is continental, the floors are mostly made of slate and granite. The vineyards are often extremely steep terraced Hanging up to 65 ° (214%) Tilt, Subareas count them among the steepest vineyards Europe. The extremely tedious management made the Romans accomplish their slaves. Dominated here Syrah, which is approved as the only red wine vine. The most important white wines are Marsanne. Roussanne and Viognier, For the most part, dark and tanninreiche Red wines also produced in larger quantities sorted. These are often classic, that is less developed in new oak. In the northern section, less than 10% of the volume of wine is produced. Further to the south gapes then in the river a gap of about 50 kilometers without viticulture or vineyards. However, further to the east is an area sometimes called the middle section on the Rhône tributary Drôme, Here are the four appellations named after municipalities Chatillon-en-Diois. Clairette de Die. Coteaux de Die and Crémant de Die with an already very old sparkling wine production. The southern section begins at Montélimar and extends south to Avignon in the Vaucluse department. The climate is Mediterranean in comparison to the northern part, the soils consist mainly of clay limestone ground. Here are many Winzergenossenschaften that produce around two-thirds of the quantity. Again, mainly red wines are produced, the most important variety is Grenache Noir ( Garnacha Tinta ). But there are about 20 different grape varieties allowed, from which many cuvées arise with a wide variety of wine styles. Other red wines are Carignan Noir. Cinsault. Mourvèdre and increasingly as in the northern section too Syrah, The typical blend here is called Rhône Recipe designated. This page was last modified at 4 May 2018 at 21:25.